1 of 6 In a medium bowl, combine cole slaw mix, yogurt, scallion, 1/4 tsp of the salt and the black pepper. Cover and refrigerate. 2 of 6 Place flour, egg whites and panko in separate shallow dishes. Whisk remaining 1/2 tsp salt into flour. Coat each piece of fish with flour, egg white and panko. 3 of 6 In a large nonstick skillet, heat oil over medium-high heat. Cooking in batches, saute fish 2 minutes per side, until golden. Place on a wire rack and keep warm. 4 of 6 Heat a stovetop grill pan to medium-high. Slice avocado in half; remove skin and pit. Grill 2 minutes per side. Thinly slice, then place on a plate. 5 of 6 Gently heat tortillas in microwave. 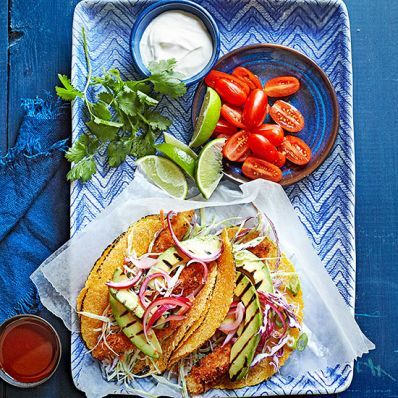 6 of 6 To assemble tacos, double up tortillas and place a few pieces of fish, some slaw and some avocado on each. Garnish with cilantro, tomatoes and onion, if using. Serve with lime wedges, hot sauce and sour cream, if using. Per Serving: 16 g Fat, total, 517 kcal cal., 2 g sat. fat, 58 mg chol., 6 g fiber, 61 g carb., 621 mg sodium, 33 g pro.